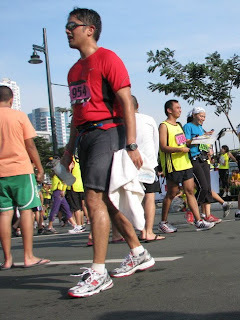 Participating in last Sunday's Adidas King of the Road race was my second time to run a distance of 10km. My unofficial time is 1hr 2min 20sec based on the big clock flashed at the finish line. However, I was stalled at the finish line because the runners were forced to slow down as the barcodes were being peeled off our race bibs. It doesn't matter for as long as I know I beat my own record by 2 minutes. Much thanks to the organizers of the Adidas KOTR! I know they've been bombarded with complaints. Many participants had to line up for more than an hour just to get their race packets. Others had the misfortune of having to wait until the last minute to get their singlets. Some even received the wrong sizes. But for what it's worth, Adidas was humble enough to admit their misgivings, and they tried to make amends the best they could. Adidas has been holding their King of the Road races for many years now, so I'm certain this year's glitch is a lesson learned for them. 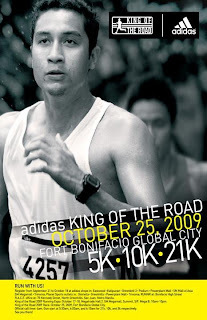 I will still join next year and hope that the Adidas KOTR 2010 will more than make up for what happened this year. The singlet is really something to rave about. I so love it! 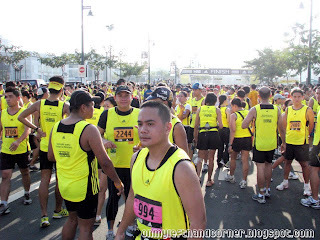 Bonifacio High Street, where the race was held, seemed like a sea of yellow as thousands of runners donned their bright yellow singlets. For a while there, it looked like a Noynoy Aquino for President movement! Other celebrities I saw (but wasn't able to take a pic) were BB Gandanghari (he looked every bit a male without makeup but with flawless skin! ), Rovilson Fernandez, and Coach Rio (LOL, he's quite a celeb already). I heard Christine Jacob-Sandejas also joined Adidas KOTR, but I didn't see her. Breakfast buffet followed at Something Fishy in Eastwood! I am a big fan of every topic related to races!